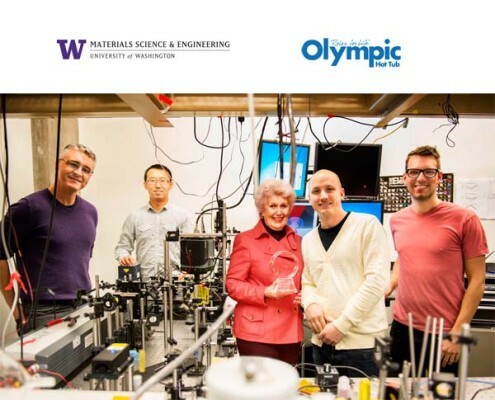 Seattle, Washington – University of Washington’s School of Material Science and Olympic Hot Tub announced a joint partnership to manufacture and sell their patent-pending “Dry Spa System”. The partners unveiled a scientific breakthrough that will revolutionize the tub and bath industry by ending wetness and allowing hot tub or bath users to leave the tub completely dry. While it seems like something out of science fiction, the science behind the breakthrough is remarkably simple. Nano-iron particles are specially designed to bond with water molecules. The hot tub or bath is fitted with a “Water Magnet System” and the nano-iron particle solution is mixed into the water. Once the system is activated, the water becomes magnetized and is attracted to the magnet in the tub. The result is hot tub or bath users leave the tub completely dry and no longer require a towel. Don Riling, Vice President of Olympic Hot Tub explained that over 100 hot tub owners in the Seattle area tested the water magnet technology and helped perfect Dry Spa technology. “The customers are ecstatic. Literally 100% of the customers testing this technology absolutely loved it.” The system requires the water magnet system to be installed in the hot tub and a 38 oz. container of “Dry Spa” solution containing the nano-iron particles. “You can set the system up in about 15 minutes and you are ready to go. The 38 Oz. solution will last 1 year. We expect the system to retail for $599 and the 38 oz. bottle of Dry Spa solution will be priced in the $50 – $100 range”. Several international towel industry associations including, Towel Industry Association of Pakistan and the Bangladesh Terry Towel and Linen Manufacturers and Exporters Association (BTTLMEA) have all threatened to seek trade sanctions against the technology. “The towel industry employs tens of thousands of workers world wide. This technology threatens to destroy our industry and must be stopped!” exclaims, Mohamudul Hasan of the BTTLMEA. Another value added feature will be the sourcing of materials to manufacture “Dry Spa”. Olympic Hot Tub will use locally-sourced iron to create the nano-iron particles. “As the Alaskan Way Viaduct is torn down, iron from the Viaduct will be harvested and recycled for the nano-iron particles in our Dry Spa solution. We are committed to sourcing local and organic iron that has been sustainably forged.” said Alice Cunningham. Olympic Hot Tub will launch regional sales in Washington in September 2016 and expects sales to be brisk. “The product will hit the shelves at the perfect time and will likely be a big hit for Christmas as the winter weather sets in. We’ll be fufilling orders no later than April Fool’s Day, 2017”, predicts Don Riling. “We anticipate a rush of orders that will take us until April 2018 to fulfill, ” he added and advised hot tub owners to Pre-Order Dry Spa Now- Call 1-888-292-0866. As the Romans said it, Res severa verum gaudium. True pleasure is a serious business. Can this be installed and used in other name brand hot tubs? If it can, is it available to order outside of Washington? I live in Georgia. Christine–This was actually a post we created as an April Fool’s story! It’d be quite something if this type of product was available!